Is it possible to have stress free moments during the wedding day? Yes! If you and your wedding photographer are on the same page. During the pre wedding consultation with our couples we often ask “Which part of your wedding is the most important for us to capture?”. Although we know that the entire wedding is important to photograph, the answer to this question makes it much easier for us to understand the couple. It’s not surprising that the ceremony and images of the Bride and Groom often top the list along with the reception images of people having a good time at the wedding. Although family photos rarely make it to the top of the list they are very likely the images which you will view a lot in the future. This makes sense if you think about it since traditionally weddings are a great opportunities for family members and friends from all over the world to come together in one place. Knowing the importance of the family photos we do suggest that you take your time when considering them. So how much time do you need for a family session? Well, usually we suggest about 15 to 45 minutes depending mostly on the number of groupings. Each group takes approximately 3-4 minutes to photograph depending on the number of people in the group. This time is used to find all of those aunts, and your missing uncle Bob before position them in the area and finally taking their photo before proceeding again with the next group. As you think through your family photo session, below are a few tips to consider which we hope will make the process much easier. STEPS TO CREATING A GREAT FAMILY PHOTO GROUP LIST. About one week to two weeks before the wedding we ask you to provide a family photo grouping list. When creating this list try to keep in mind the below points to make the process painless. List groups as per the next description: Group 1: Bride and Groom + Grooms Parents, Dave and Mary. Please include family role and name. Start with the largest groups first working your way to smaller groups. This makes the process much easier for your guests. Start with older people first so that they can finish the session quickly. Keep in mind that each group will take about 3-4 minutes to photograph. So if you have 10 groups 30-40 minutes will be needed during your wedding day photography schedule for the family session. 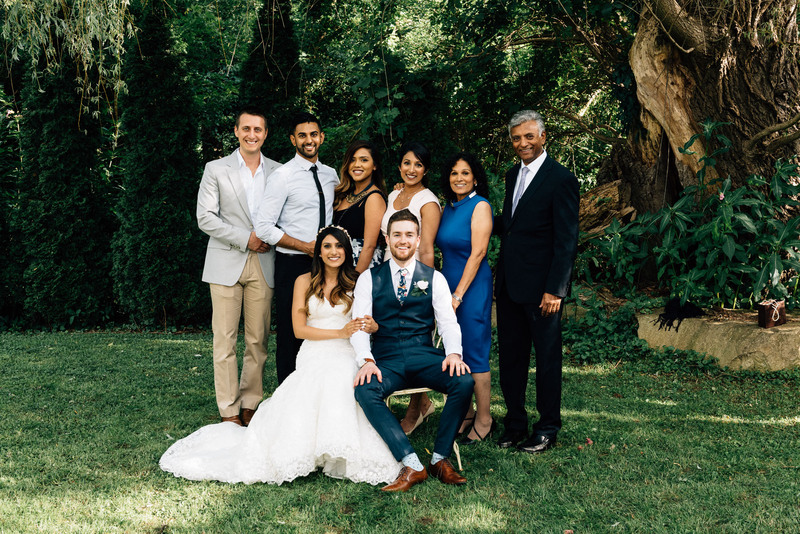 Once you have the family groupings created, the below tips can make the entire process go smoothly on the day of your wedding. Have a “Photography Wrangler” or two, who knows everyone on both sides of the family to help find each group member. Make sure your family members know about the photo session, the scheduled time, who the Wrangler is and where the photos will be taken. Ideally, working with the photographer, keep the guests and the photo area, close to the Cocktail area. This way it will be much easier to find your uncle Bob for sure! Most likely the family photo area will be located in the shade for both the comfort of your family and the good light quality. This is simply something to keep in mind. Finally below are a few tips which you can use during your family session. Some of the tips may seem like common sense for sure, yet we promise that if you follow them along with all of the other tips in this blog your family photos will look truly amazing! TIPS DURING THE FAMILY PHOTO SESSION. No sunglasses as they hide the eyes. No drinks in hand or visible around the session. Everyone most see the camera lens to be visible in the photo. Following the above tips will no doubt ensure that your family session turns out great providing you with incredible memories for years to come! Of course if you have any questions or comments on any of the above, please let us know!